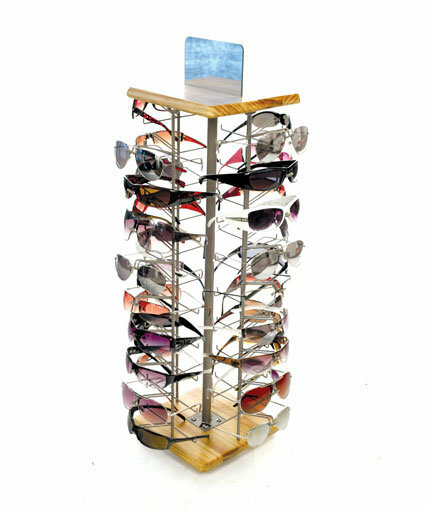 Our elegant four-sided spinning sunglass display holds 96 glasses. 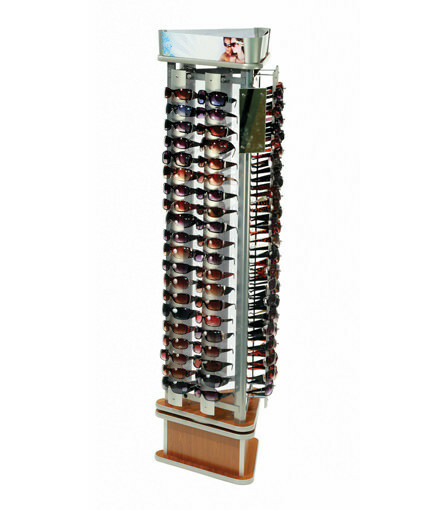 Like the other displays in signature LINK Series of retail sunglass racks, the SU-96LINK offers a compact 19″ footprint, making it a smart choice for almost any retail environment. The display features a shiny silver frame, anodized aluminum panels, chrome nosepieces, 1 glass mirror, a crown with interchangeable header graphics on 4 sides, and a cherry finish. After years of listening to our customers and making ongoing design improvements, we know one thing for sure: The SU-96LINK sells sunglasses. 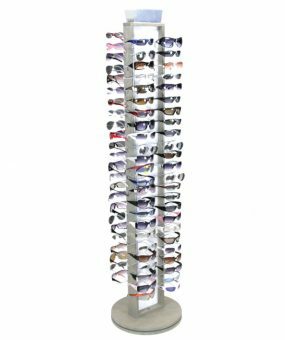 Our customers tell us that relative to other sunglass display racks, they like the way the design of the SU-96LINK puts the focus on the glasses and not the display- a sign of effective merchandising. 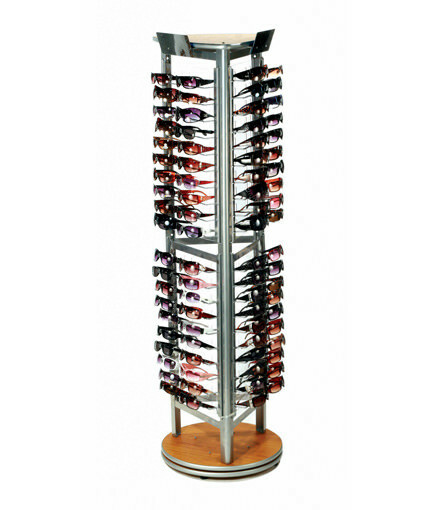 Our customers like being able to use the fixture for reading glasses as well as large-framed designer sunglasses. They like the fact that the display spins and can be effective in almost any location from an open floor location to a tight corner spot. The like the simplicity of the display and the value it offers by virtue of its durability and superior craftsmanship. They like the fact that it knocks down for shipping and is easy to assemble. 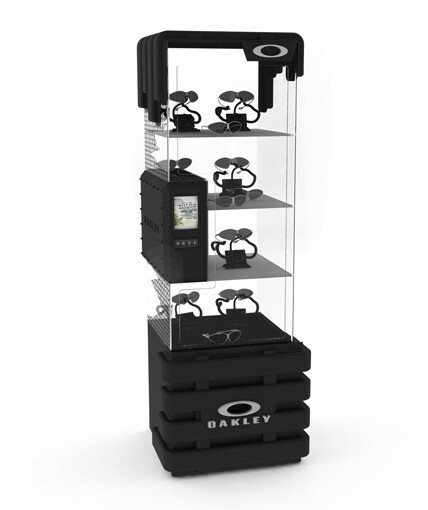 They like the accessibility of the sunglasses and how the display offers the customer the opportunity to interact with the sunglasses compared to a locking sunglass display case. Not only is this unit easy to service, but it is extremely versatile with regard to its ability to fit in almost any retail store environment. 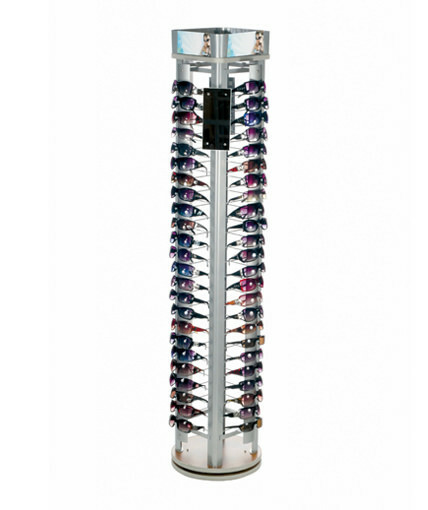 The bottom line is that the SU-96LINK is in an elite class of sunglasses displays and has a proven track record of increasing eyewear sales, maximizing retail sales per square foot, and driving a positive and measurable return on investment. 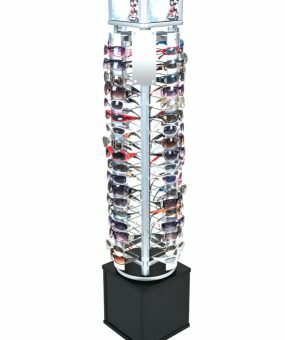 If you are looking for a mid-capacity retail sunglass fixture, give the SU-96LINK a try today.